June 2, 1990 – SSN 753 entered the dry-dock at Newport News Shipbuilding for emergency repairs. Underway for sea trials from June 19-20. September 28, 1991 – The Albany entered the Newport News Shipbuilding for an eleven-month Post Shakedown Availability (PSA). Underway for sea trials from Aug. 29-30, 1991. November 8, 1991 – Cmdr. William F. Murphy relieved Cmdr. Darl R. Anderson as CO of Albany. February 11-22, 1993 –The Albany was in dry-dock at Newport News shipyard for emergency repairs. Underway for sea trials from Feb. 26-27, 1993. May 14, 1994 – Cmdr. Kevin P. Ryan relieved Cmdr. William F. Murphy as CO of Albany. March 23-27, 1995 – In dry-dock at Newport News shipyard for emergent repair to sonar system from April 4-15; Underway for POMCERT from April 17-21. February 21, 1997 – Cmdr. Brian O’Neill relieved Cmdr. Kevin P. Ryan as CO of Albany. December 2, 1997 – SSN 753 entered the floating dry-dock USS Resolute for a three-month Selected Restricted Availability (SRA). February 27, 1998, departed for sea trials. February 2000 – The sub was in floating dry-dock Resolute to repair a seawater system valve. September 18, 2001– USS Albany entered the dry-dock at Norfolk Naval Shipyard in Portsmouth, VA, for a 14-month Depot Modernization Period (DMP). June 1, 2002 – Cmdr. Brett J. Genoble relieved Cmdr. Paul N. Jaenichen as CO of Albany. July 3, 2002 – SSN 753 moved from dry-dock to a pier-side location at Norfolk Naval Shipyard. Underway for sea trials from Nov. 18-24, 2002. October 10, 2003 – USS Albany entered the Medium Auxiliary Floating Dry Dock Resolute for a three-week upkeep. Returned home on Nov. 24, 2003. April 1, 2005 – Cmdr. Mark H. Merrick relieved Cmdr. Brett J. Genoble as CO of Albany. June 9, 2009 – SSN 753 undergoing a maintenance availability at Naval Station Norfolk to upgrade equipment and conduct necessary repairs. March 16, 2011 – Northrop Grumman has been awarded a contract valued at $25 million for the preparation and completion of a dry-dock continuous maintenance of the Albany, that arrived at Newport News shipyard Tuesday morning. Work is expected to be completed by the end of July. NEWPORT NEWS, VA, July 29, 2011, Newport News Shipbuilding division has successfully redelivered the Los Angeles-class submarine USS Albany (SSN 753) to the U.S. Navy. 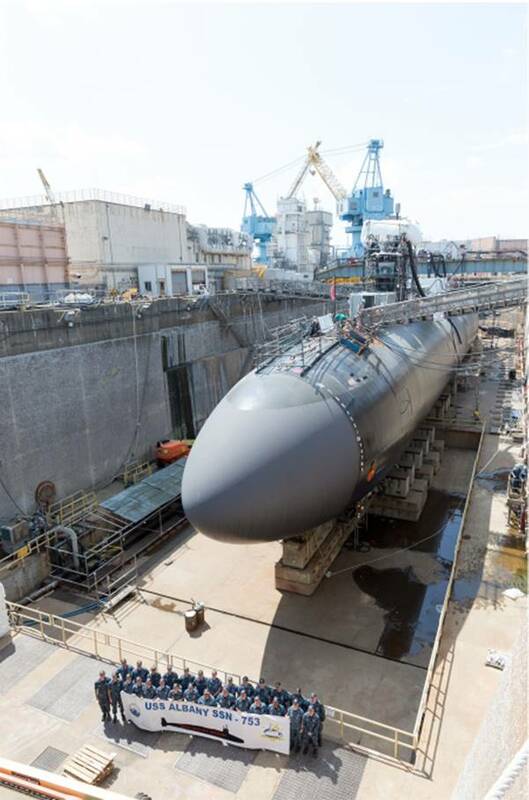 Huntington Ingalls Industries announced that the company’s Newport News Shipbuilding division has successfully redelivered the Los Angeles-class submarine USS Albany (SSN 753) to the U.S. Navy. The redelivery took place today, one day earlier than originally planned, following successful sea trials. The ship began its Docking Continuous Maintenance Availability March 15 at Newport News Shipbuilding. The work included upgrades to the submarine’s sonar, navigation, communication, combat and weapons systems and maintenance work on the propulsion, weapons, sonar, auxiliary and habitability systems. USS Albany was the 18th Los Angeles-class submarine built by Newport News Shipbuilding. The ship’s keel was laid April 22, 1985. The submarine was launched on June 13, 1987, and commissioned into service April 7, 1990. 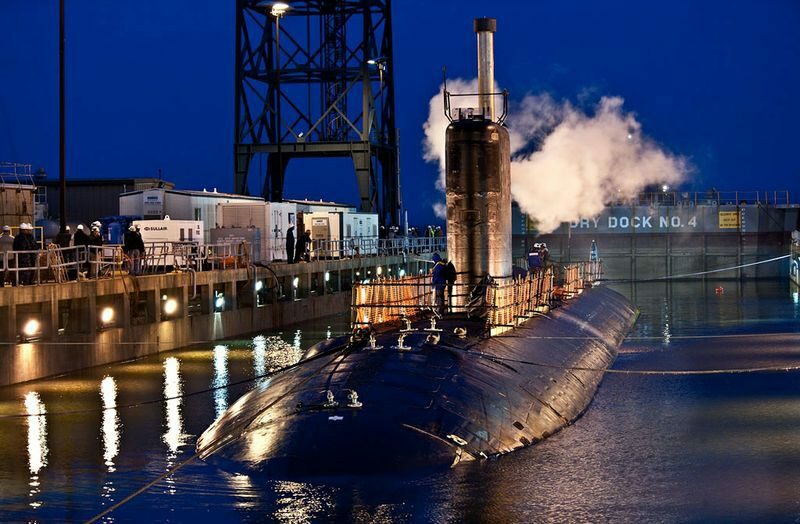 October 17, 2013 – SSN 753 entered the Norfolk Naval Shipyard in Portsmouth, VA for a 29-month Engineered Overhaul (EOH). The USS Albany arrived at Norfolk Naval Shipyard on Wednesday ahead of its scheduled Engineered Overhaul. USS Albany (SSN 753) arrived at Norfolk Naval Shipyard (NNSY) for its Engineered Overhaul (EOH) availability Oct. 16. The work included involves a large modernization package and extensive maintenance to Albany, a 300,000-plus man days availability. The team will be having a complete package done including removing the shaft and the sonar dome for maintenance. In addition, Albany will receive the latest combat systems package currently being developed, a first for NNSY. 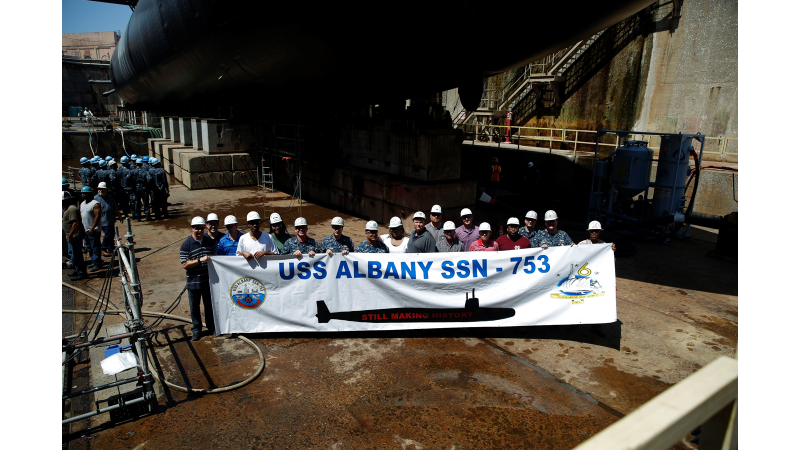 A package similar to USS Newport News (SSN 750), the Albany team is utilizing the lessons learned in the work being done. Another first for NNSY is that “USS Albany will be the first to incorporate full Job-Readiness Cells (JRC) and Zone Management from the start of the project,” said Tim Cox, Non-Nuclear assistant project superintendent (APS). Incorporating the shipyard’s Mission, Vision and Values as well as the three Strategic Goals, the team has prepared diligently for the boat’s arrival. “All Zone Managers and APSs are fully qualified,” said Superintendent Dave Bittle. In addition, the team members have been well-involved in learning cells as well as managing training to be a fully qualified workforce. Their work areas and the drydock is clean and up-to-date, something the group takes very seriously. 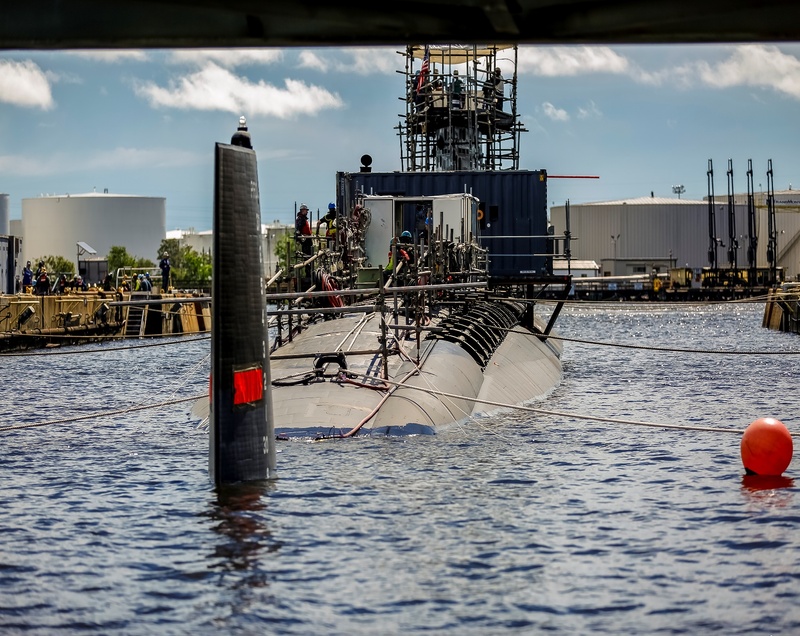 Norfolk Naval Shipyard’s (NNSY) Inside Machine Shop successfully performed its first rudder repair since 1991, on USS Albany (SSN 753), which is currently undergoing an Engineered Overhaul. The job started in September 2014 when the rudder was transported to the shop for repair. It was completed last month and is currently in the process of being reinstalled on the Albany. 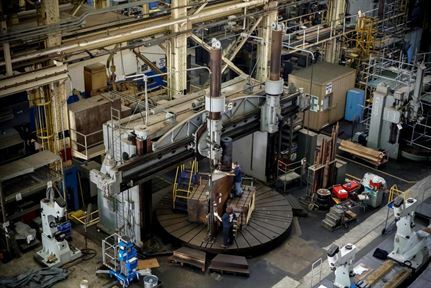 The repair was performed using the shop’s Betts Machine, a vertical turret lathe that has been in the shop since 1928. The last time the Inside Machine Shop machined a rudder at NNSY was 1991 on the USS Wainwright (DLG 28). Albany’s Engineered Overhaul, the largest maintenance event the boat will experience in its operational life-cycle, is comprised of a large modernization package and extensive refurbishments. 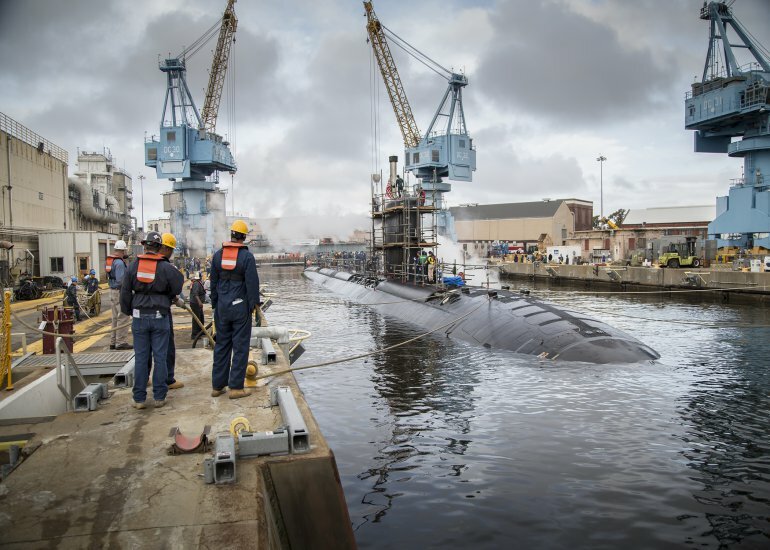 NNSY, a Naval Sea Systems Command field activity, is the oldest industrial facility belonging to the U.S. Navy, and specializes in repairing, overhauling and modernizing ships and submarines. This is ALBANY as her stern crossed the sill of the drydock, where the exchange of responsibility for ship safety, shifts from the Shipyard Commander to the boat’s Captain. After leaving drydock, Albany moved to pier-side and will continue her updates, crew training and various sea trials. It is estimated that she will not be reassigned to the active fleet until the middle to late 2018.